Kathy White: New Workshop Date in Blyth! New Workshop Date in Blyth! This morning I woke to the fragrant scent of wood smoke mixed with the chilly, oxygen charged air that follows a rain storm. At last, it is autumn and I'm feeling reinvigorated and ready to jump back in the game. 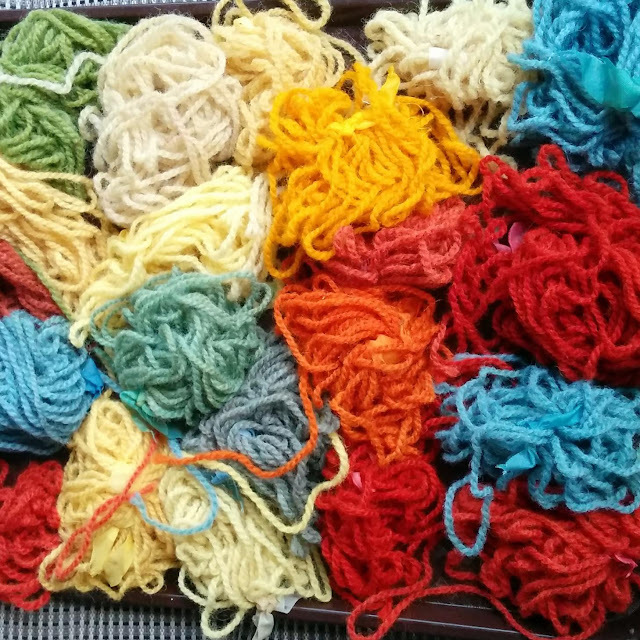 The fibre art game, that is. My experience as an artist in residence with the Kingsbrae International Residency for the Arts (KIRA) was unspeakably inspiring - truly a once in a lifetime opportunity - and it has taken me a few months to reorient myself and figure out where to go from here. This video about the KIRA program gives you a small taste of what it was like to be surrounded by so many talented artists. I even make a small appearance! Kingsbrae International Residency for the Arts (KIRA) - Promo video (1min.) from Jeff Lively on Vimeo. One of my priorities after returning to Ontario was to follow up on a lead about a dyer's garden that someone in Blyth was starting and I am so happy that I followed my gut on this one. It turns out that 'someone' is Jennifer Triemstra-Johnston, a costume designer, teacher, business owner, and fibre arts school visionary. Jennifer is the force behind the Fashion Arts & Creative Textiles Studio as well as the creator and founder of Pick a Posie Costume Company. She is wonderfully connected and extremely knowledgeable about all things fibre and I am so excited to be teaming up with her to finally - FINALLY! - offer a course in the Blyth/Goderich area. 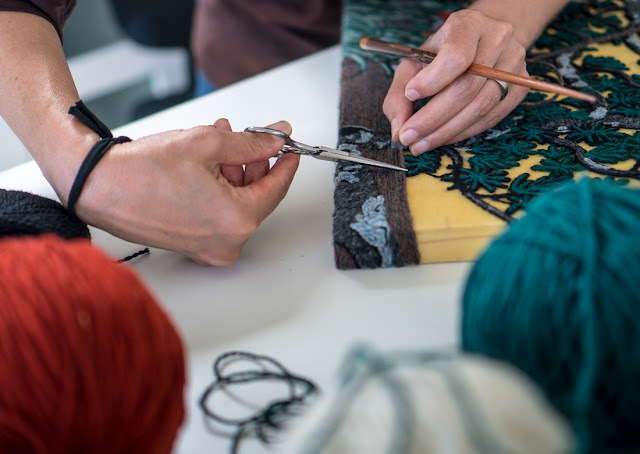 The workshop is on October 20th in Blyth and you can find out the details and register here. I learned so much during my residency in St. Andrews, NB and reconnected with the beauty of pure Canadian Briggs and Little wool and I'm going to bring all of that new learning and enthusiasm with me to the workshop! We'll try out some new techniques and broaden our creative horizons. 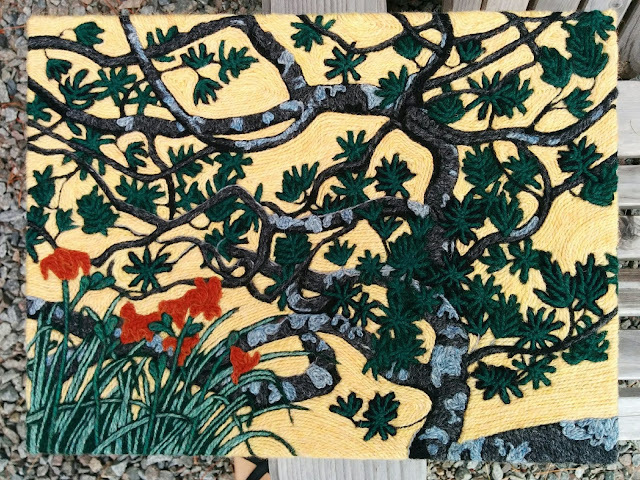 Kingsbrae Mugo Pine, Canadian Briggs & Little wool, Peruvian wool, & Beeswax on Wood Panel, 9" x 12 " x 1"
I'd love to see you at the Blyth workshop hosted by FACTS. Jennifer has created great energy and momentum around the studio and I cannot say enough good things about the recent two day natural dying workshop I enjoyed as a participant. An entire weekend outside learning how to turn plants and flowers into natural wool dyes - I was in heaven and have developed a new obsession with woad. Unexpectedly vibrant colours - all from plants. I have LOTS of glitzy upcoming holiday events to share with you, but we'll save those for another day. Its time to dig out my wool sweaters and head outside to watch the leaves fall. Oh, before I forget - I'm finally on Instagram! (I know, I know - a little late.) You can follow what I'm up to and see my most recent work at @kathywhiteart.